Fits a variety of 19" rack-mountable mixers. 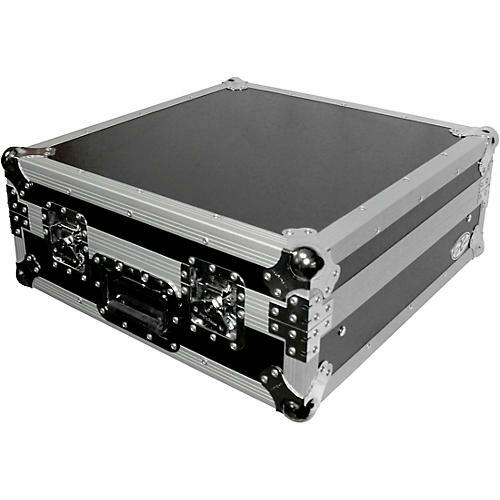 This case is the perfect fit for smaller rack-mountable mixers that need quality protection. The T-MC is designed to handle a wide variety of 19" rack-mountable DJ mixers and DMX lighting controllers, or any other standard 19" rack gear. Fits up to 10U mixers. Depth from top of rear rail to bottom base of interior, 6". This ATA-style, road-ready flight case has a sleek, professional look that is sure to turn heads and make your setup look legit. It’s manufactured with a rugged, laminated surface for added good looks and durability. Unlike standard laminated plywood ATA-style cases, ProX’s surface design helps prevent minor to mild scratches. All ProX cases use CNC technology during the manufacturing process to ensure consistent build quality. Rugged steel-ball corners offer added durability, while steel butterfly latches let you secure the case with a lock, and spring-loaded, recessed steel handles offer a convenient, ergonomic way to carry the case. Protect your gear while lending it a professional look—order today.